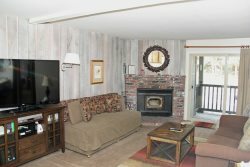 Standard Two Bedroom & Loft & 3 Bath Condominium in town near the Sierra Star Golf Course and the shuttle route to the Eagle Lodge Express Ski Lift Area in Mammoth Lakes. Sleeps up to 8. Second Story unit with 2 levels. The Master Bedroom has 1 Queen Bed. The second bedroom has 1 Queen Bed and the Loft has 1 Full Bed and 2 Twin Beds. Wifi Internet Access in the unit. There are 2 outside parking spaces available. There is a game room with a billiard table, a ping pong table and a video game in the lobby of the Sunshine Village condos. In the summer you have access to BBQ areas throughout the complex and a Tennis Court near the swimming pool at Sunshine Village. Coin-operated laundry facilities located in the common area near the office. TOT LICENSE 3390-SV138. Check in was easy and simple, the place was just what we were looking for or the price and size of our party. Overall Id highly recommend a stay here! The condo was easy to check into with a lockbox at the office. The space itself was decent and came with clean towels, but the kitchen had the bare minimum (no salt and pepper, not much soap). I really liked the recreation area. Theres a ping pong table, pool table, and sauna. Nice place to stay. About 5 mins from the village. The staff was very accommodating. We had a very nice stay.